Discover classic flavors with these three dishes from Senegal and Ghana. 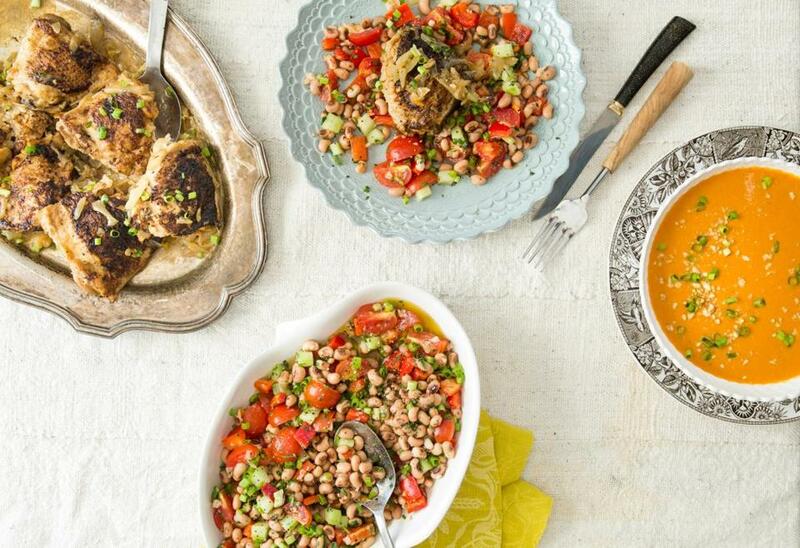 Photograph by anthony tieuli; food styling by Sheila jarnes /Ennis inc.
Chicken yassa (left), Senegalese-style back-eyed pea salad (center), and West African-style peanut soup. Many of us are familiar with at least some African cuisines. Moroccan, Algerian, and Tunisian from the north of Africa, and Ethiopian and Eritrean from the east have been popular in our country for years. But these days, the cuisines of Senegal and Ghana, in western Africa, are getting attention, too. Groundnuts, a.k.a. peanuts, are used widely in soups, stews, sweets, snacks, and spice mixes. Here, peanut butter flavors a smooth, refined first-course soup. Next, a piquant salad of black-eyed peas and fresh vegetables accompanies yassa, a dish of chicken or fish marinated in citrus and mustard and cooked with loads of browned onions. The peanut butter imparts significant richness, so a little of this silky soup goes a long way. Peanut butter without sweeteners is best here. In a Dutch oven or large soup kettle over medium-high heat, heat the oil until shimmering. Add the onion, bell pepper, and 1 teaspoon salt and cook until the vegetables are softened, about 4 minutes. Adjust the heat to medium-low, cover, and continue cooking, stirring occasionally, until the vegetables have released their juices, about 8 minutes. Adjust the heat to medium-high, add the garlic, ginger, and cayenne and cook, stirring, until fragrant, about 40 seconds. Add the broth, tomatoes, and sweet potato and bring to a strong simmer. Adjust the heat to low, cover, and simmer until the sweet potato pieces are very tender, about 25 minutes. Add the peanut butter. In a blender or with an immersion blender, puree the mixture (working carefully and in batches if using a blender) until smooth and uniform. If you puree in a blender, you can achieve a smoother texture by straining the mixture before returning it to the pot. Add the brown sugar, 1 teaspoon salt, and black pepper to taste and heat over medium-low heat, stirring occasionally, until soup is heated through. Adjust the seasoning with salt and black pepper if necessary. Serve at once, garnishing with sprinkles of crushed peanuts and scallions. Very often the chicken is grilled, but in a nod to our locale and season, I cook it on the stovetop. In place of the olives that are usually added before serving, I use scallions for color and freshness. Serve with white rice. In a large nonreactive bowl, whisk the lime zest and juice and 1½ teaspoons salt. Add the garlic, mustard, chili pepper, 2 tablespoons oil, and 1½ teaspoons black pepper and whisk until uniform. Add the chicken, turn the pieces to coat thoroughly, cover, and refrigerate for at least 6 and up to 24 hours. Remove the chicken from the marinade and wipe off the pieces; reserve the marinade. In a large Dutch oven over medium-high heat, heat remaining oil until shimmering. Add the chicken pieces, skin side down (do not crowd — work in batches if necessary), and cook, undisturbed, until skin is crisp and golden brown, about 3½ minutes. Turn the chicken and continue to cook, undisturbed, until second side is golden brown, about 3½ minutes longer, adjusting the heat if the fond becomes too dark. Transfer the chicken to a large plate and, if working in batches, repeat with remaining pieces. When the chicken is cool enough, remove and discard the skin if desired. Off heat, spoon or pour off all but 1 tablespoon of fat from the pot and return it to medium-high heat. Add the onions, reserved marinade, and 1½ teaspoons salt and cook, stirring and scraping the bottom of the pot with a wooden spoon to dissolve the fond, until the mixture reaches a strong simmer and the onions begin to release moisture and soften, about 8 to 10 minutes. Adjust the heat to medium and continue cooking, scraping the pot to dissolve the fond that will form periodically, every 8 to 10 minutes, until the onions are reduced, well browned, and sticky, about 30 minutes longer. Add ½ cup water, adjust the heat to medium-high, and bring to a strong simmer, scraping the pot with a wooden spoon to dissolve the fond. Add the chicken with its accumulated juices, nestle the pieces into the onions, and return to a simmer. Adjust the heat to low, cover, and simmer gently until the chicken is cooked through and tender, about 35 minutes. Transfer the chicken to a platter, cover loosely with foil, and rest for 5 to 10 minutes. Meanwhile, taste the onions and adjust seasoning with salt and black pepper, if necessary. Add most of the scallions and stir to mix. Spoon onion mixture over and around the chicken, sprinkle with remaining scallions, and serve at once. The peanuts used to garnish the soup should be finely crushed, because larger pieces can sink to the bottom. Chopping is time-consuming and doesn’t do a great job. I like to put the peanuts on a cutting board and use a small saucepan to bear down hard while gently twisting the pan. In a large bowl, whisk the lime juice, chili pepper, 1 teaspoon salt, and black pepper to taste. Vigorously whisk in the olive oil. Add the black-eyed peas, cucumber, bell pepper, tomatoes, scallions, and parsley and fold to mix and coat with dressing. Adjust the seasoning with salt and black pepper if necessary, and serve. Adam Ried appears regularly on “America’s Test Kitchen.’’ Send comments to cooking@globe.com.